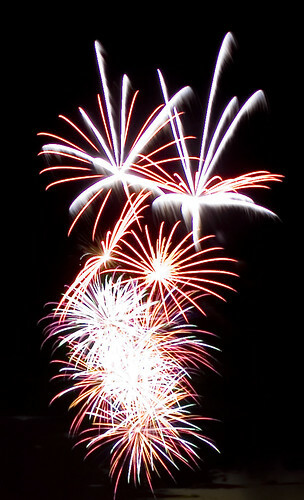 Here’s yet another shot from Australia Day – a handheld one. The tripod was too low where we were and I couldn’t get a clear shot of the sky without ground light ruining it, so I tried some handheld shots. My arms got tired and Dave took over, so I don’t know which of us took this one but I think it came out pretty good. We went tonight to the a Perth Festival sponsors and media garden party. Good fun, lots of free drinks. There’s lots of great events in this year’s festival – full details on the official Festival web site. Keating!, the event that we’ve been aligned with, has sold out already, as well as a number of other events. Looking forward to that and a whole lot of others! ~ by goatlady on February 1, 2007.